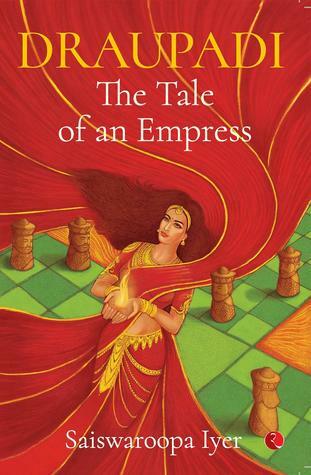 This book broadly covers the Mahabharata story with Draupathi as the focal point, how the whole story revolves around her and what actually happened to her. Some liberties have been taken, for example in the original she shown to come down to earth as a fully grown woman but here she is shown from her young age. The story starts with Rajamatha Uttara and her grandson, Bharata. She is the narrator of the story and she tells her grandson what actually happens while including herself as a character in the epic. To fit such a large story into a regular sized paperback is definitely a challenge. So there are a few timeline jumps here and there. If you are familiar with the story of Mahabharata you will not find it difficult to follow. But at times it feels a little dissatisfying. The Pandavas are shown with both their strengths and weaknesses. Usually most people tend to praise them to high heavens and completely ignore their faults but the author doesn’t do that here. She does a quick but thorough character breakdown and shows them for what they truly are. The pace is steady, the language simple (the author doesn’t faff about with words to try and impressed the reader. She’s made it very accessible to most readers) and the characters well written. One can always argue that these are tried and tested characters and that there is hardly any work involved in making them great, but I like to think of it as characters that are written about so much that it’s hard to make them interesting. But Sai Swaroopa does manage to pull the reader in and keep them engaged, yet again, in these people’s lives. It’s not that I specifically disliked anything. But I found that she was mostly obeying her mother in law and we don’t really get to see if she is annoyed by it or not. It is frustrating at times to see her turn into a puppet pushed onwards by her mother in law’s words. Buy the book. It’s an excellent read. And you will like it for what it is.